On October 22, Rep. John Garamendi (D-CA) initially offered an amendment to the House Transportation and Infrastructure’s markup of the surface transportation bill to strip the legislation of its provisions on qualifications-based selection. The amendment was met by stiff opposition from NSPE, other engineering organizations and committee members. Rep.
On October 15, NSPE President Tim Austin, P.E., F.NSPE, sent a letter to Ohio Rep. Ron Young, chairman of the Ohio House Commerce and Labor Committee, formally endorsing Ohio House Bill No. 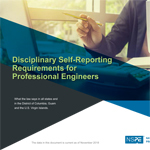 236, requiring professional engineers to complete continuing professional development hours in professional ethics or rules relevant to engineering practices. The legislation was introduced by Rep. Louis Blessing III, P.E., an NSPE and OSPE member, and Rep. Al Landis. On September 21, Rep. Bruce Westerman, P.E. (R-AR), an NSPE member, filed an official complaint with the Colorado Department of Regulatory Agencies, Division of Professions and Occupations, regarding the August 5, 2015, Gold King Mine disaster. In a September 17 congressional joint oversight committee hearing, Westerman asked Environmental Protection Agency Administrator Gina McCarthy why a licensed PE was not in responsible charge of the Gold King Mine project. At a joint hearing of the House Committee on Natural Resources and the House Committee on Oversight and Government Reform held on September 17, EPA Administrator Gina McCarthy testified about the role of the EPA in the August 5 Gold King Mine blowout that resulted in a three-million gallon toxic spill into the Animas and San Juan rivers. Rep.
On September 14, NSPE submitted a public comment to the Environmental Protection Agency (EPA) commending the agency for proposing additional safety measures requiring a professional engineer to prepare site-specific gas collection and control system (GCCS) plans as part of the proposed rule Emission Guidelines and Compliance Times for Municipal Solid Waste Landfills. NSPE is saddened by the recent gold mine blowout of the Gold King Mine, which resulted in a three-million gallon toxic spill into the Animas and San Juan rivers affecting communities in multiple states. This spill has brought under scrutiny the EPA’s requirements and practices. Although specific details regarding the onsite team and its practices have still not yet been fully disclosed, NSPE strongly urges the EPA and all federal agencies to review their existing requirements and practices. On August 20, as the result of extensive advocacy efforts by the Indiana Society of Professional Engineers and NSPE, the Indiana Job Creation Commission (JCC) rescinded its troubling recommendation to eliminate licensure of the Professional Engineer. The JCC, which was created in 2014 to examine the licensing of all of the state’s professional boards, released its draft report on June 17 recommending elimination of the PE license in Indiana. Action Alert! Tell Congress to Invest in Long-Term Infrastructure Funding Today! On July 29th Congress yet again failed to come to agreement on a long-term infrastructure bill and instead settled for a three month patch that will run out on October 29th. This is the 34th short-term extension in the past ten years. Long-term legislation is needed for PEs to properly plan, design, implement, construct, operate and maintain our nation's infrastructure systems. On June 29th, NSPE unveiled a great new advocacy resource for all NSPE members: the PE Legislators webpage. Professional engineers are impacting policy at all levels of government. Learn about PEs who became legislators and their experiences, and gain insights into how NSPE members can advocate for the profession. Included are helpful advocacy training tips.